The holidays are fast approaching and I'll openly admit that I'm less than prepared, but I am enjoying myself and know it will all get done with time to spare. I took a break from work and holiday prep today for a little quality kitchen time. All in all, it was a little over 4 lbs of peeled and sliced apples that cooked in the crock pot for about 3 hours with a wee bit of water and a touch of lemon juice. I mushed them with a potato masher (fancy, right?) and water bath canned in half pint jars. I had a small bit of applesauce left and I'm saving that for breakfast tomorrow. It is SO yummy!!! A rough idea of the size of the needle and yarn (nothing teeny or ginormous). At least 2 skeins of yarn are used - remember this is a WIP so there might be more yarn already knit up. There are charts and counting involved - it's good for keeping the brain sharp and it's not a "knit to 'x' length" kind of project. 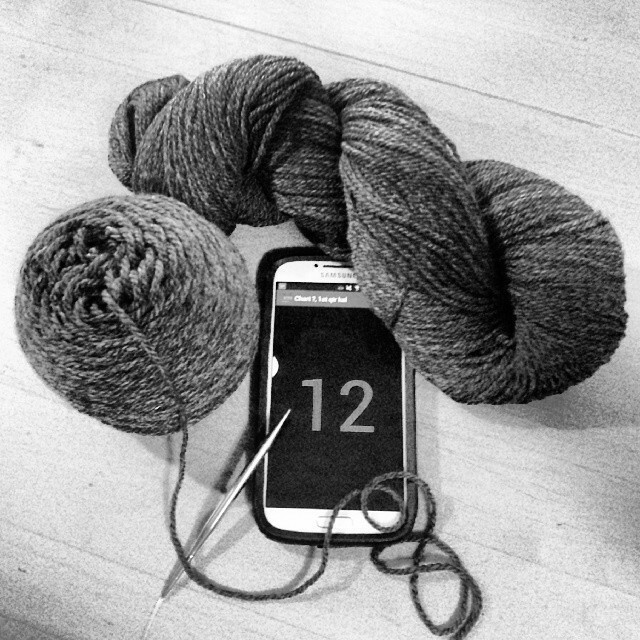 I will also add that the yarn will be a new addition in 2014 and I love it! Like, REALLY love it! How's your holiday preparation coming along? Are you on task or am I the only one that's fallen behind already?